Tenth edition of BarCamp Prishtina marked the first success of the beginning of the year, and the eighteenth edition ended up just as successful as each edition organized during 2013. The position of women in our society was the main subject of our guest speakers. 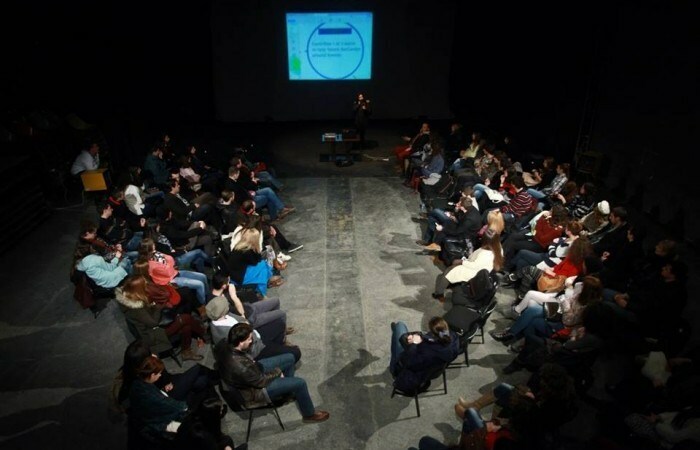 Haveit, Blerta Zeqiri and Anea Hapçiu were the guest speakers to present in front of more than 70 people at Teatri Oda. Dressed with their performing costumes, Haveit started this BarCamp edition with a bunch of photos from their activities. Starting from performances in front of the National Parliament to the film festivals, their voice is being heard and their ideas are being spread. Each of the girls explained in details how they came with the idea and how they performed. BarCampers had the chance to speak and discuss in details the reasons behind their activities. A successful filmmaker from Kosovo, winner of international prizes and a dedicated mother. Blerta Zeqiri chose not to speak about her successes. Instead, he started speaking about her life as a girl growing like a boy. “I grew up as a man. I acted like a man. And that was not easy”, she explained. Her life in Prishtina and Paris and the difference approaches of these two cities toward women were the shocking part of her story. “In Prishtina, one of my professors insisted that being a producer is not appropriate for woman. Knowing that, it was hard for me to tell my professors in Paris that I was pregnant. I thought they would prejudice me. But it was totally different”, Blerta said. A young girl into the entrepreneurship. Successfully running a new business in town. Annea Hapciu was the third speaker to end this edition of BarCamp with an interesting idea of combining yoga with life. Being pushed by her friends and family, Annea started her business of yoga club just recently and is successfully operating in Prishtina.